We threw our first house party for my 31st birthday and it was truly a dream come true with all of my favorite things in our backyard. Catching up with friends and family, sipping on bubbly, and crushing some delicious crawfish. 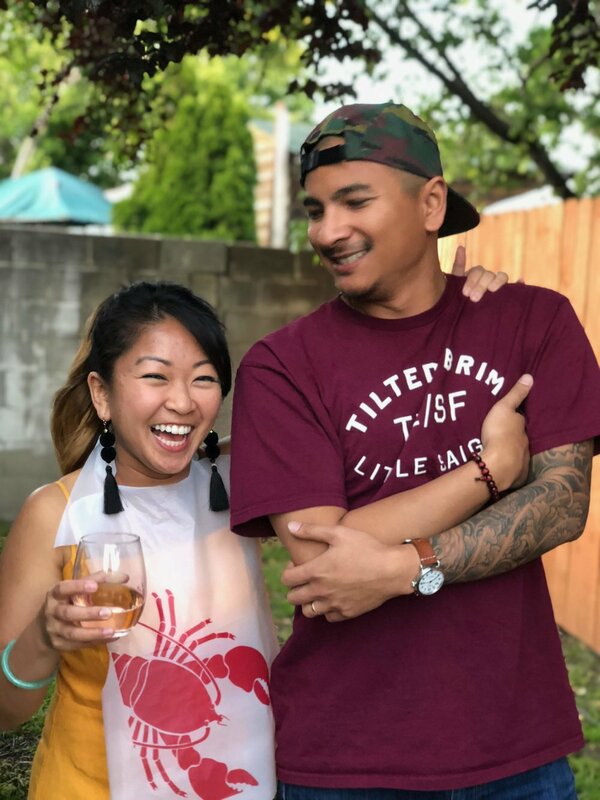 The theme was inspired from the shrimp and crawfish episode from Ugly Delicious where they went into the history of how Viet-Cajun started in Houston. After watching this show, I had so many questions for my mom about her recipe so I took her to my favorite local crawfish restaurant to taste their seasoning. She highly approved! 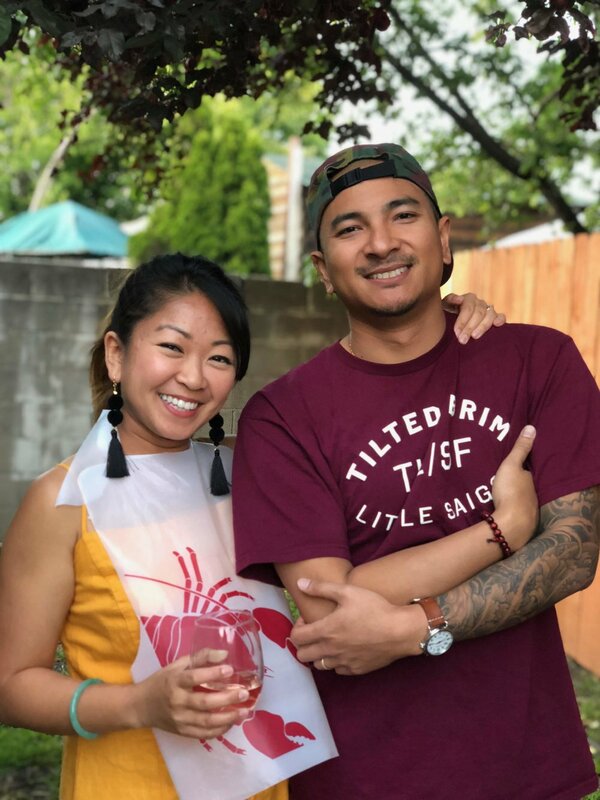 I grew up with my parents throwing backyard parties with their friends where my dad would come home with a truckload of live crawfish and my mom would whip up the boil infused with lemongrass. We laid out newspaper on the table and poured out pounds of crawfish. I must have been around 6 years old learning how to eat crawfish like a pro. Here's what I learned about her recipe: Louisiana cajun seasoning, fuji apples, lemongrass, etc... My mom learned about the key ingredient from a friend who moved to California from Houston. I had no idea so learning all of this gave me so much appreciation. So fast forward decades later, I was able to have my parents sit back, relax and enjoy crawfish and shrimp at my party instead of doing all the cooking. I sent out a Paperless envite to my 30 guests with instructions to place their order through Google Form. I'm so glad I decided to rent enough chairs, it made it much easier than stressing about having enough seats. Looking forward to renting glassware and plates next time. A mistake I made was combining our order by pound total, doh. Next time, I'll place my order with the restaurant as is and ask them to bag it separately. My amazing friends Linda and Judy spent over an hour splitting the 40 lbs using a kitchen scale and compost bags to keep them hot. Everyone got their correct orders and we crushed them! I forgot that this was some people's first time trying crawfish or Viet-cajun style so I gave them a demonstration on how to deconstruct a crawfish and they claimed it was life changing. It was actually a really hard week leading up to the party. With the news of Kate Spade and Anthony Bourdain, I was just super sad and really in my feelings. But my husband reminded me that it's probably the best medicine, to be surrounded by loved ones during this time. In the end, I think it was best tribute celebrating another year with my friends and family over drinks and great food.